Since 1908, this classic tale of inquisitive Mole, stolid Ratty, gruff Badger and ‘ever in trouble’ Toad has delighted children of all ages, and most adults too! 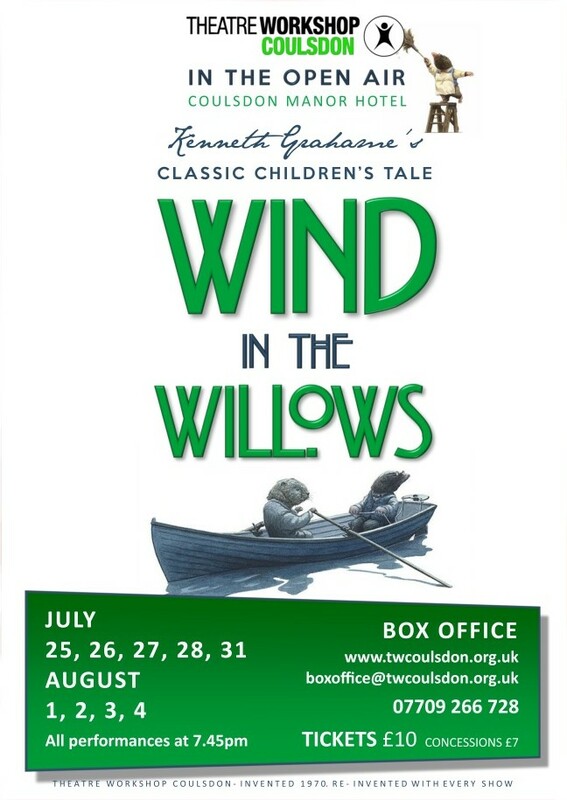 This stage adaptation by Theatre Workshop Coulsdon follows their adventures from the river bank to the Wild Wood, via the open road to the deepest dungeon, with a thrilling climax at stately Toad Hall. It’s a path strewn with boats, trains, caravans and stolen cars, as our animal heroes overcome adversity and their own natures to emerge victorious. By turns charming and funny, this is a splendid way to while away a English summer’s evening. Audience seating is on a first come, first served basis and on grass, so come early and bring a blanket or your own folding chair to sit on if you want a comfy seat and a good view. But please don’t bring high-backed chairs – they’ll stop the people behind you seeing the show! And remember, it can get cold at the end of the evening, even in the middle of summer (it is England after all), so please bring warm clothing, rugs, and so on – just in case. A barbecue and outdoor bar will be available from 7.00pm on performance nights. Full bar meals will be available at the hotel at any time – but reserving a table is recommended. The play takes place on licensed premises by kind permission of Coulsdon Manor, a Bespoke Hotel. So out of consideration to our hosts, you are respectfully asked not to bring your own food or drink for consumption on the premises. Thank you. Wednesday 25 to Saturday 28 July, and again from Tuesday 31 July to Saturday 4 August. All performances start at 7.45pm.